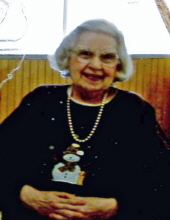 Mary Nadine Davis, age 89, of Clinton, moved on to Heaven, Tuesday, March 19, 2019 at Clinton Healthcare and Rehabilitation Center. Nadine was born June 12, 1929 to Dorman and Flossie Davis of Calhoun, MO. Living North of Calhoun, she attended Calhoun School. Her family moved to Clinton in the 60’s. Nadine enjoyed helping on the farm, she loved music and playing guitar, she was a big fan of Roy Rogers and Dale Evans, the Lone Ranger and Gene Autry. Nadine also loved watching birds and enjoyed family birthdays and Christmas celebrations. After her mother’s death, Nadine continued to reside at Clinton Healthcare and Rehabilitation Center where she was very active. Doing her patriotic duty, she raised and lowered the American flay with pride. She also ran the store and attended many other activities. Nadine was known for her sense of humor and great smile. Surviving Nadine are several cousins. She was preceded in death by her parents, Dorman and Flossie and an older sister, Ella May. A graveside service is scheduled at 2:00 PM on Friday, March 22, 2019 at the Calhoun Cemetery. Memorial contributions may be made to Twin Lakes Hospice and left in care of Consalus Funeral Home, 209 S. 2nd St., Clinton, MO 64735. Condolences may be left online on this website. To send flowers or a remembrance gift to the family of Mary Nadine Davis, please visit our Tribute Store. "Email Address" would like to share the life celebration of Mary Nadine Davis. Click on the "link" to go to share a favorite memory or leave a condolence message for the family.